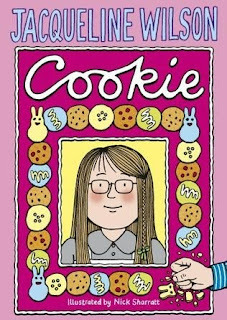 I was vaguely aware that Jacqueline Wilson was very popular in the UK and the couple things of hers we have at our library check out consistently. 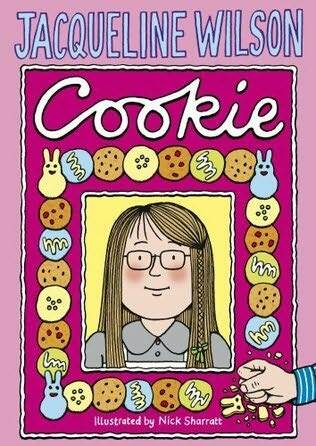 So, I picked up an ARC of Cookie at ALA and decided it was time to read my first Jacqueline Wilson, spurred on by a young patron at our library who told me how much she loved these books. Beauty Mercedes Cookson is not the pretty, perfect girl her father wants. Her mother, a fluffy, pretty, ditzy girl (she's barely older than Beauty) can't always be perfect either. His frightening rages and vocal abuse finally go too far and Beauty and her mother leave. Through a series of lucky circumstances, they find a better life and settle down happily. If all Wilson's mothers are as "fluffy" as Mrs. Cookson, "Silly Dilly", I can see Ms. Yingling's complaint about the repetition. On the other hand, I've known quite a few moms like this - whose responsible daughters ended up taking over the household. I think it's unrealistic to expect Mrs. Cookson to be a mature, logical adult, as it's stressed throughout the book that she's never had the chance to be an adult. But although she makes a lot of foolish mistakes, she really tries hard to do what's best for her daughter. And Beauty, renamed Cookie, does end up with a better life. Wish fulfillment? Of course. We all need a little fluff in our lives. Verdict: This is a fun, escapist read with some darker moments. Two kids decide to form a club for doing good deeds. Unfortunately, their good deeds go awry and cause problems. In the end, they stop some thieves and the people they caused problems for forgive them. Sound choppy? Well, unfortunately so is the book. Some of the oddity of the story can be contributed to it being Canadian, such as school ending in April. But there are many more problematic elements in the book. The children's ages are never given, but they appear to be around 8 or 9. But they take the bus alone to a kind of public market, Granville Island and handle a lawn mower on their own. If they're supposed to be older, their behavior is extremely childish and the story as a whole would not appeal to an older audience. Wendy, who has the idea for the club and sticks to it even when her friend Zachary wants to quit, is unbelievably oblivious of the havoc she's causing. The sudden apprehension of the thieves is plopped into the plot without warning and the story ends so suddenly that I went back and checked the publication data to see if a page was missing. The black and white illustrations are engaging, but not enough to redeem the flat storytelling and loose plot. The reading level seems to be beginning chapter book, but the storyline is more suited to an early reader audience. Nathaniel Fludd hasn't heard from his parents in over three years. He's been living with his comfortable, if not very interesting, governess. Suddenly, his parents are declared missing, Miss Lumpton disappears with the Tidy Sum left her in his parents' will, and he's on a train going to a new home and a distant cousin. Once he arrives, Nate's adventures start immediately. But is he really an adventurous Fludd? Or just a scared little boy who can't live up to his family's high expectations? This is definitely a first book in a series - there are soooo many ends left untied. What happened to Nate's parents? What was Miss Lumpton hiding? Who is the mysterious ginger-bearded man? Will Nathaniel's drawings be important later on? I can't wait to find out! Verdict: Kelly Murphy's black and white illustrations are charming and add to the gentle humor that runs through this story. The adventures are exciting, but not too perilous. A fun transitional chapter book (I just made that up - it's a little harder than a beginning chapter book, not quite a middle grade chapter book) that kids interested in strange beasts and adventures will enjoy. Pass this one to fans of R. L. LaFevers' Theodosia, any of the -ology books from Candlewick, and any child lucky enough to be a fan of David and the Phoenix. Ok. You have your average nerd/secret society story. Outcast kids turn out to be amazingly cool, band together, save the world, and totally destroy the popular kids. Or just never see them again. And we all learn a VERY IMPORTANT LESSON. And then you have NERDS: National Espionage, Rescue, and Defense Society. It starts out with all the stereotypes: geeky kids who don't fit in because they lack social skills or have physical issues or are just weird. Super cool kids who torment the nerds. Slick, professional secret agent sent to take charge of their secret government operation. Evil/crazy villain and stunningly beautiful henchwoman (well, really goon but she's kinda sensitive about that). And then....Michael Buckley takes all these elements and turns it into something completely different. About Michael Buckley. I skimmed part of a Sisters Grimm book several years ago. But as I was currently involved in skimming HUNDREDS of books to create fantasy bibliographies for the School of Education library at UIUC (You can see them here if you're interested) it didn't really sink in. Over the past couple months, I've had a small but steady stream of kids "where's the Sisters Grimm?" "Why don't you have all of them?" Leading me to add the rest of the series to my "series to fill in when money falls on my head out of the sky" list. And then, ALA. The very first publisher I happened upon was Abrams. And there was Lauren Myracle! And she was signing books! And I thought, SUMMER READING PRIZE! And then I noticed another book, with kinda a cool cover, and thought, "oh, I'll get that one too." Then I took a closer look, "oh, it's that guy the kids keep talking about. Cool, I'll get an autograph, and tell him how much the kids like his books." So I added it to my giant stack and staggered home. Yesterday evening, after an exhausting day of programs, shelving (my aide is out of town) and just STUFF. I sat down for cartoons and a book. And this one happened to be on top of my pile. So, back to the book. As I was saying, before I digressed into la-la-land (hey, it was a REALLY LONG DAY), this is an exuberant, explosive book. Literally! It explodes conventions. It explodes scientists. It even explodes guinea pigs! It shakes up ideas about bullies, popularity, nerds, and beauty pageants. It has tons of exciting action, cool gadgets, weird superpowers, and suitably malicious villains. Kids aren't just nerds, bullies, secret agents, or assassins. They're also...kids. Who sometimes learn how to change and grow....and sometimes don't. Buckley has even managed to make the adults believable and dimensional characters. And it's got hilarious little inserts between each chapter! And....*drumroll please*....it's got guinea pigs! Yes! Woot! Verdict: Fans of the Benedict Society, Kiki Strike, Joshua Mowll, Catherine Jinks' Evil Genius, David Lubar's Talent books, and all things gadgety, secret societish, and geekly, will be thrilled to read this! And if not....we're WATCHING you. Squeak! Clover Twig is the organizer, the tidy one, the one who takes charge in a large and messy family. When she starts working for the local witch, Mrs. Eckles, she will need all of these qualities - and more - to make it through her first week! Clover Twig is a brisk and cheerful heroine, always ready with ideas, cleaning supplies, and common sense. Her tidiness is frequently endangered by the unbelievably clumsy and accident-prone Wilf, but she likes him anyways. Mostly. The plot is as tidy and well-constructed as Clover Twig's newly cleaned witch's cottage and the characters are fun and memorable. Mrs. Eckles is as endearing a personality as Clover Twig, although she's not without her little secrets. The villains are satisfyingly villainous without being cartoonish and the plot twists and turns are funny and exciting. Oh, and my only complaint is the cover. If we could have fewer covers featuring girls, it would be easier to get boys reading fun books like this! The British cover is better, although it gives away the plot rather badly. Just my opinion. Verdict: An excellent step-up from beginning chapter books. Fans of Suzanne Selfors, Angie Sage, and Katie Speck will enjoy this story. It took a whole box of tissues and lots of breaks to finish this book, but I couldn't stop reading. Aubrey's grief and her reactions to the tragedy that has destroyed her family are wrenching and realistic. Although she slowly heals throughout the book, ending on a note of hope, I still found myself crying at the end. 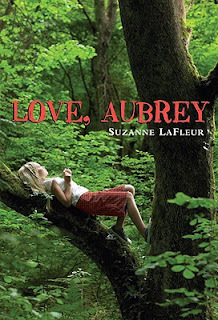 The story is, perfectly, tightly focused on Aubrey's own pain and recovery and as she begins to live again in the world around her, we learn more about her new friends through Aubrey's eyes - I'd be interested in maybe seeing companion novels about Aubrey's new friends. I can see parents not wanting their kids to read this because of the high emotional content (no, I am not being silly. you would not believe the vast variety of elements parents can object to in the books their kids read. Not the tv they watch, just the books they read) but I'd say this was an important read - not just for those who have experienced tragedy, but for kids who've never known what it's like to have a loved one die. This beautifully-written novel will draw them in and allow them to empathize and understand others who are experiencing grief. Stunning photographs by Nic Bishop. 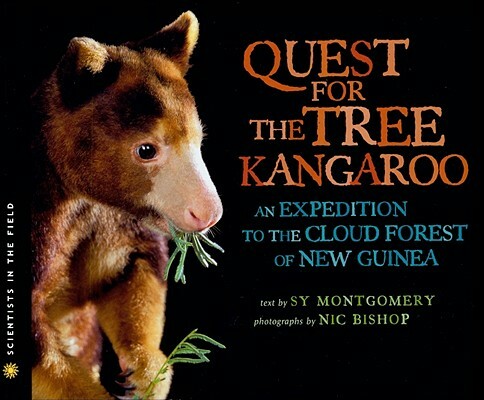 He brings the cloud forest to life and makes me want a tree kangaroo to cuddle! Brisk, expository text by Sy Montgomery. She includes facts, stories, descriptions, history, and science in a wonderful blend that holds the reader's attention throughout the story. Makes this book truly amazing as it is one of the few science/travel type books which really shows the local population as friends, scientists, and assistants without patronizing them or denigrating their help. 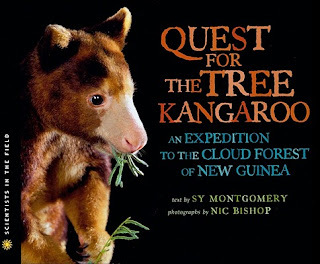 What makes this book even better, is that Sy Montgomery has managed to give equal importance to the local conservation efforts and the local culture as she gives to the Western scientists. It's a new model for scientific field expeditions and a large part of what makes this book stand out. Excellent sources and other information, including pronunciation guides and sources for more information about the people, places, and animals in the book. Verdict: This series is one that should be on the shelf of every library. It will take a little time to find them all, as there is no comprehensive list, but it's worth the time! Home with the spoils from ALA! Woo-hoo ALA! I got tons of absolutely amazing books. And met real LibraryThing people (and got a t-shirt) which was cool. And saw demos of the computer software which our library is considering. And looked at furniture - but didn't see anything which looked workable for our teen area. And if I ever go again I will take a backpack and gloves - my hands are painful after lugging all those bags around! We saw many famous people, such as Neil Gaiman (we were coming from the other end of the aisle as he was signing for the loooooong line coming the other way. I liked Graveyard Book, but sorry, I still think he looks creepy. Maybe because somebody thought it would be a good idea to introduce me, person who never reads horror, to graphic novels via Sandman. And Lauren Myracle and Michael Buckley who signed books! Lauren Myracle wanted me to take her picture! With a pink camera! But I had to say no, because I cannot take pictures. And we saw John Green. Several times! Laughing loudly with friends at a table in the cafeteria! And Amy Krouse Rosenthal! Small cool things - Penguin magnet and pin, Duck! Rabbit! pin (it changes when you tip it! very cool! ), sample chapter of DiCamillo's Magician's Elephant, Catching Fire pin (they had an ARC of Catching Fire there and I thought it was kinda funny that it was TAPED SHUT so no one could peek. Not really a Collins fan, so I found it funny not frustrating (-:), fall sampler of Scholastic Audio. Cute little promo booklet for Mo Willems Big Frog. Other cool things - free audiobook of Voyage of the Dawn Treader! And Arthur Upfield - the rep tried hard to convince me that if I liked Kerry Greenwood I would like listening to Upfield, but I haven't listened to Kerry Greenwood, only read her and I'm very chary about audiobooks, so I let our adult services librarian steal it from me. Because she did not get a cool maroon LibraryThing t-shirt, only a black one, although, as I pointed out, he offered it to me first because I am an Important and Huge Member of LibraryThing. Plus, I got there first. Copy of Kiki, a new magazine for girls which looks interesting. And I bought Tim Kennemore's Alice's World Record and Alice's Shooting Star, because I ordered them in NOVEMBER and our vendor insists on saying the publisher is out of stock, which is obviously not true because they had STACKS of them! I got Violet Wings by Victoria Hanley!!! Woot! I can't wait to read this and I know several teens (including my sister) who are going to be very excited too! A bunch of little chapter books based on Naruto and Dragon Ball, which are going into the very nice Viz bag I also got as a summer reading prize. Two!! of Leslie Margolis' Girls Acting Catty. These are going to be highly-sought after reading prizes and I was very happy to hear that Margolis has been signed on for more books in the future. And no, I was not greedy, the rep. offered me an extra when I gave her my Boys are Dogs booktalk which convinces even boys to read this book! Walt Disney's Peter Pan - the Mary Blair picturebook. It's hard to decide what to do with picturebook ARCs, I might use this one for wallpaper. Gorgeous, gorgeous illustrations. Luv ya bunches by Lauren Myracle - signed! this is going straight out as a summer reading prize! Syren by Angie Sage - summer reading prize! And had a long and excellent exchange of ideas with a neighboring librarian on the bus ride home. Worth any amount of sitting in conference rooms. I had about 350 kids last year....by next week, after summer school visits, I will have hit 500 kids registered. Our circulation is breaking records, our attendance is going through the roof, and I am constantly running out of prizes, reading logs, and more! Which is excellent, if a little exhausting. We had our second program for older kids today, henna tattoos with a local family (mother and three daughters). They were amazing! We had 15 kids 12 and over, which is better than any program I've scheduled for this age group. Sadly, the artists are moving/going to college, so I will have to do the search for a henna artist thing all over again next year. Argh! Alice's third and final story is by far the most hilarious of the trilogy. Rosie, her terrible little sister, is just getting interesting. At least, Alice thinks so. Alice's parents and her perfectionist older brother, Oliver, don't agree. They say Rosie is lying and needs to learn to tell the truth. Woven into the family's efforts to curb Rosie's imagination, are Alice's feelings that she is a dull and uninteresting person. But as the story progresses, Rosie and Alice both find new abilities and in a side-splitting conclusion, become stars! Alice is a thoroughly endearing character. She doesn't want the limelight, like Rosie, but she does want a little recognition and attention at times. Her tenacity and common sense turn out to be just as effective as Rosie's wild imagination and the growing relationship between the sisters is both funny and touching. Verdict: I highly recommend the Alice trilogy to beginning chapter readers and it will be enjoyed by adults and as a read-aloud as well. Funny, engaging, realistic, and hits exactly on the feelings between siblings and especially of the middle child. A must for your library collection. Frankie Pickle is an explorer, an adventurer, on the track of missing artifacts, like....the last breakfast waffle! He's also a fourth grade kid who just doesn't want to clean up his room. Frankie thinks he's solved everything when his mom tells him "This is your space. Do with it what you want." But Frankie soon finds out there are less than pleasant consequences to a swinish life and he must face his greatest adventure ever - the Closet of Doom! Pros: Frankie is an engaging character and will resonate with kids. One of my favorite scenes is immediately after his "deal" when he goes to make a sandwich in the kitchen; and leaves everything out. "We have an understanding" he tells his older sister. The comics are lively and kids will enjoy the juxtaposition of Frankie's black and white daydreams and his actual adventures. I appreciate that Frankie is given a choice and decides to face up to the consequences of that choice, although the story doesn't descend into didacticism. Cons: I can see a lot of kids liking this book, but it hit several of my buttons and I just....don't like it. First, the don't clean your room up until it's so messy horrible things happen is not a new idea - it's one of Mrs. Piggle-Wiggle's cures. Although I have to say, having a parade go by your window and not being able to escape from your room is no more believable than waking up from a nightmare and cleaning a week's worth of mess in one night....without waking anybody up. This cure, assuming it works at all (some kids would live perfectly happily in a huge mess - and do) requires that the kid has his own bedroom and owns enough stuff to blockade himself in. I didn't really like the slightly-changed-brand-names thing, although that may keep the book from getting outdated quite as fast. Will kids know that "Yugimon" cards are referring to Yu-Gi-Oh cards in another five years? Or that Avril the Traveler is really Dora the Explorer? It felt kind of forced to me. What really irritated me - the Dryer Sheet Fairy. Now, I'm sure Frankie knows it's really his mom mysteriously collecting, washing, drying, folding, and putting away his laundry. But he's 9. If he's old enough to fix himself a sandwich and use the vacuum cleaner, he's old enough to do his own laundry!! It's a personal peeve when parents, especially moms, clean up after their kids. Of course, these things (like the baby watching television - bad! bad!) make the story realistic. They just irritate me personally. Verdict: Aside from my personal peeves, this is a fun story and will really grab reluctant readers. I've read Timothy and the Strong Pajamas by Viviane Schwarz in several storytimes. I loooove Viviane Schwarz (There are Cats in This Book). The kids were ok with it, no particularly strong reactions...today, we were having a "let's get dressed!" storytime. I read Naked Mole Rat Gets Dressed. I read Princess Bess Gets Dressed. We sang The Ants Go Marching (for no particular reason, just to march). I had about 4 girls and 2 boys. At this point, the 2 boys were rolling around on the floor. And then I read Timothy. Right away, they both sat up. They were mesmerized. They started getting involved in the story, "wow, he's strong" "look, he's lifting the WHOLE ELEPHANT". And when we got to the end and they saw his new power....mere words cannot describe their enthusiasm. For our craft, we were "dressing" paper cut-outs of people (left over from a gingerbread boy craft). The two boys immediately dived for the blue markers; "we're going to draw strong pajamas"! They drew strong pajamas (stripey blue ones) added red buttons of braveness, and extra laser eyes! Our Biggest Summer Reading Program! Next year, put David Stokes in the middle of the room, instead of at the end. It got very crowded (and hot, despite me squeezing past everybody to turn down the a/c). Also, make sure the new aide I'll be hiring in August can take pictures. Mine are awful, but my current aide took great David Stokes pictures! Our favorite is the excited kid with his hands in the air! Note from last Friday's fingerpainting: put newspaper on the tables next time. And that's all. I collapse in peace. When I first received this book, I looked at the cover and decided I probably wouldn't like it because a. it was ORANGE (despite - or because - I grew up in Austin, TX, I hate orange) and b. it just looked silly and I wasn't in a silly mood. I was wrong! I loved it! First, you have to know that at our library we collage frequently and with great enthusiasm. I mean, what's not to love? All you need is paper, glue, and whatever you can find in the cupboard and outside. Add imagination and it's art! And here is a book, all about collage! All the different bits and pieces come together in the end, on an eye-smacking double-fold-out, to create a classroom of enthusiastic students. The words dance in exuberant rhythm towards the final mischievous joke and I can see children chanting along after a few readings. According to the back flap, the paper Ms. Tillotson cut for the illustrations she created herself by drawing patterns on paper with paste. Apparently this is an old crafting technique, one I shall have to look into as it sounds fun! The illustrations abound with things for kids to find and point out and the final spread shows them all fitted together into various wacky creatures. Oh, and they sent an adorable collage bookmark with the book! I am in love. 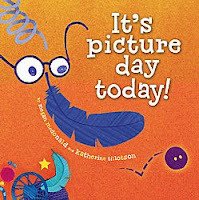 I plan to pull this out many times in the future for my storytimes to get us ready to put things together and create pictures! Verdict: Recommended for storytimes and for reading before collaging! This story is written in the tradition of friend and school stories of an earlier era. Set in the Depression, ten-year-old Allie's family has just moved into a new house, thanks to her father finally getting a job. She starts to make friends with Martha next door, but soon discovers she isn't the perfect best friend. At first confused and embarrassed by Mimi across the street, Allie finally comes to realize she is more "interesting" and trustworthy than Martha. Small touches throughout the book place it in the Depression era - a hobo at the door, Shirley Temple, tap-dance class, and the various financial difficulties of Allie's friends' families. 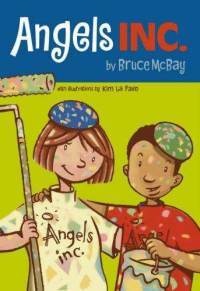 There is also a minor theme of religious difference and prejudice - Allie and Mimi are Jewish, Allie. M. (Allie's new friend at school), Martha and her unpleasant friend Cynthia are Catholic. But there's no stereotyping and the characters are not one-dimensional types. The story is pleasant and flows well, showing Ms. Hoberman's mastery of words. Allie's thoughts and feelings are well-expressed and the story is a pleasant, light read. The ending is not completely resolved but the depiction of Depression-era problems and issues is realistic and not excessively preachy. However, I am having a hard time coming up with an audience for this book. It is being promoted to ages 8 - 12, but I find it difficult to think of any tweens who would pick this up. 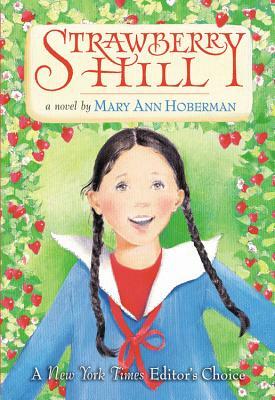 Compared to her modern sisters, such as Judy Moody and Allie Finkle, Allie Sherman is bland and sedate. Just as Gardam rewrote the holiday family adventure genre of Elizabeth Enright, Ms. Hoberman has rewritten the school and friendship genre of the Moffats and other similar stories from the time period. Fans of Lenski's Strawberry Girl, Fisher's Understood Betsy, and Estes' Moffats and Hundred Dresses may find this an additional and enjoyable read, but it doesn't have the staying qualities of a classic. Verdict: Families looking for a peaceful read-aloud at bedtime may enjoy this.